Technology giant Microsoft reported a 7% fall in profit during the second quarter. The company said profit during the March to June period was $4.6bn (￡2.7bn), compared with $4.97bn during the same period last year. Microsoft said its Nokia division, which it acquired in April, lost $692m. Last week, Microsoft announced it would cut 18,000 jobs - the biggest round of job cuts in the company's 39-year history. 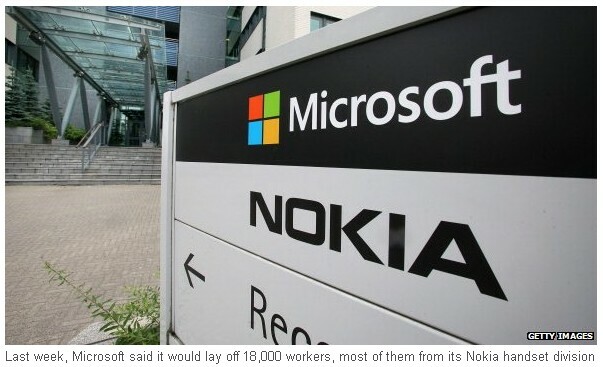 Around 12,500 of those positions will be eliminated in the Nokia phone business. "We are driving growth with disciplined decisions, bold innovation, and focused execution," said chief executive Satya Nadella in a statement, choosing to focus on revenues from Microsoft's cloud division, which he said were set to double to $4.4bn this year. Shares in Microsoft were mostly flat in trading after stock market hours, although they are up more than 20% for the year as investors hope Mr Nadella's vision for change will lead to a boost in the bottom line. Last week, Mr Nadella said that he was cutting positions partly as a result of incorporating Nokia's thousands of workers into Microsoft but also in an effort to move the company away from its core software operations towards its cloud computing business. Cloud computing allows companies to rent computer services including software and storage, in flexible bundles, rather than investing in expensive equipment themselves. Microsoft's job cuts total more than 14% of the firm's 127,000 workforce - which is nearly 50% bigger than that of rival Apple.